2 May 2017: In the end, the so-called gentlemen's agreement won the day at the Badminton Association of Malaysia. You can tell that deals and sacrifices were made. The man whom many had thought should be president ends up as Advisor, the man who wanted to be president despite already wearing too many hats is the new President, and the former president who purportedly made out the gentlemen's agreement on his way out due to illness is now Honorary President! All's well that ends well? Time will tell. Norza Zakaria, the new president of BAM, has at least shown that he is listening to his critics: "I've been told that I'e been wearing too many hats. 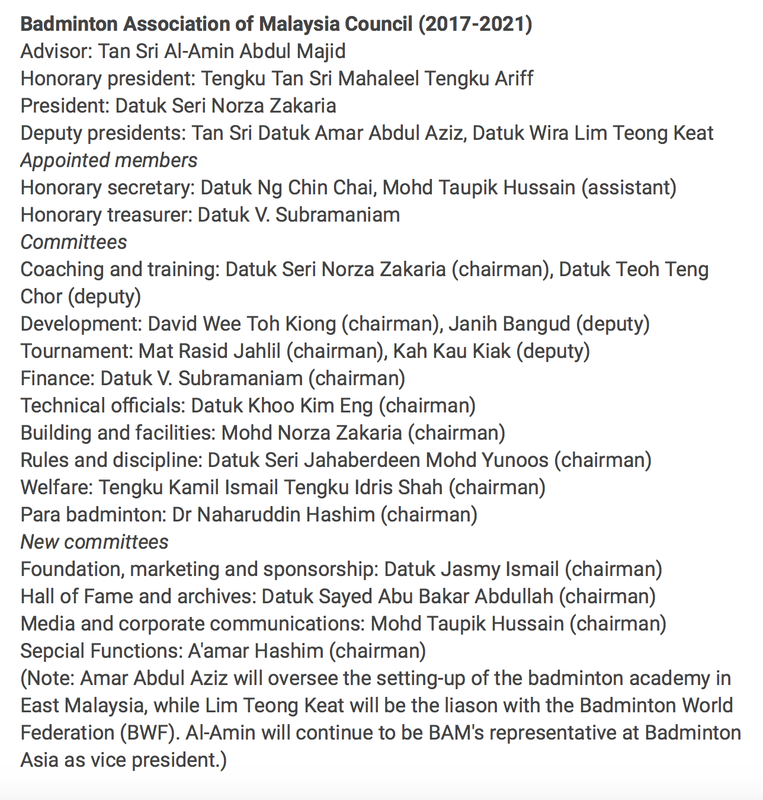 As the new BAM president, I'll be more focused on badminton now," he said. That, I must say, is a good start. Norza has reportedly relinquished his posts as National Sports Institute chairman and KL Badminton Association president immediately after his election as BAM president. Just the Olympic Council of Malaysia deputy presidency to let go for Norza to be really more focused now. I wish him and the new BAM line-up all the best. The following are the individuals who won the elections last week. They are responsible for making sure that now that they have put themselves there, the game and nothing else but game wins big. Is he the same person when brought to court found sheding tears some years ago when the sleeping PM's men went on a rampage at the corridor of power? Is he the same person acted as a baggage man to a present minister in a PMO during sleeping PM' time?